Updated April 21 Amazon.com USA pricing info from the company: Amazon has it at $61.99 right now and the keyboard is going for $57.37. For users of mobile devices on the go, it is required to have a case and protection for your device while traveling. The people that do long travels may want to be productive. People using a mobile device, such as an iPad, may find the onscreen keyboard annoying, in which case having a physical keyboard is necessary. Our friends at Fellowes have a few accessories for mobile users that are of interest to business travelers. I tested the MobilePro Series Deluxe mini Folio for iPad mini 4 and MobilePro Series Bluetooth Keyboard with Case for you. Both accessories are built of nylon material that feels solid to withstand frequent usage. 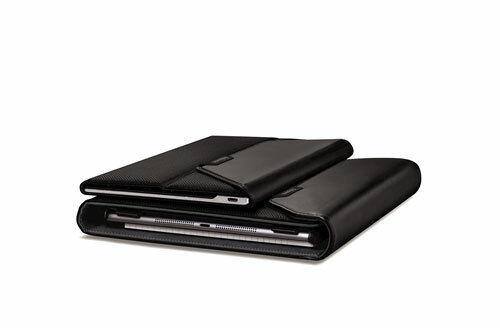 The folio has compartments to store business cards and up to 50 sheets of paper. One side has an included paper pad and a pen holder. On the other side, is a case for iPad mini 4 that is also a stand with three viewing angles, and which can hold the iPad in landscape or portrait orientations. 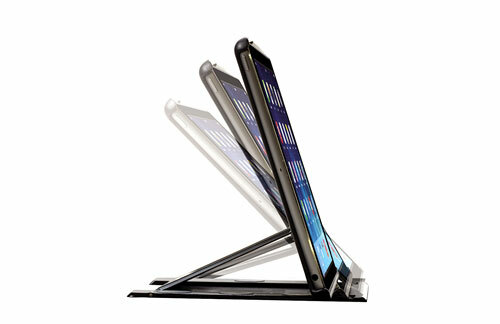 The stand is detachable from the folio; you can use it as a stand alone case or stand for your iPad. The folio closes on itself using a strong magnet. The Bluetooth keyboard is very nice to use, and the keys feel similar to an Apple keyboard. The travel depth of the keys is short making it comfortable to type. In fact, I’ve been typing this whole review using Microsoft Word on my iPad mini with the Fellowes keyboard. It is a universal keyboard for iOS, Android and Windows devices that supports Bluetooth. I like this, as many keyboard cases are specific to a model of device, and when you upgrade it becomes obsolete. Connecting it to the iPad is a very simple process, as it should be with Bluetooth. 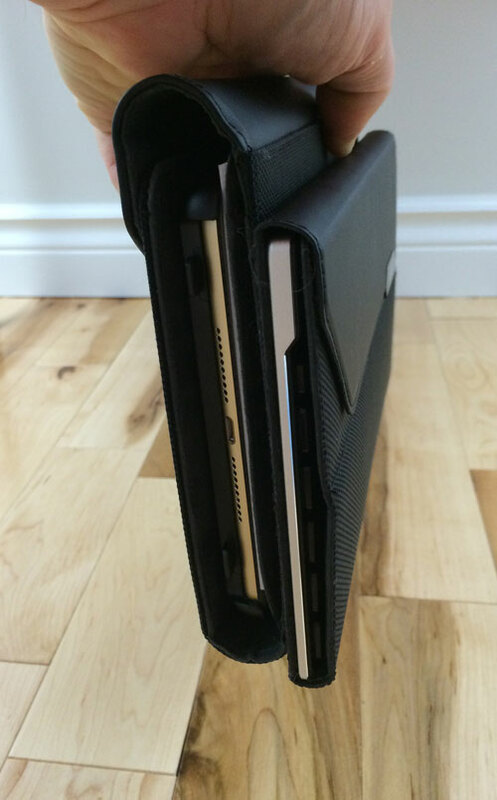 When you are traveling, the keyboard case and the folio secure themselves with strong magnets on their backs. Depending on which device you use, the special function keys at the top will have different usage as seen in the table below. 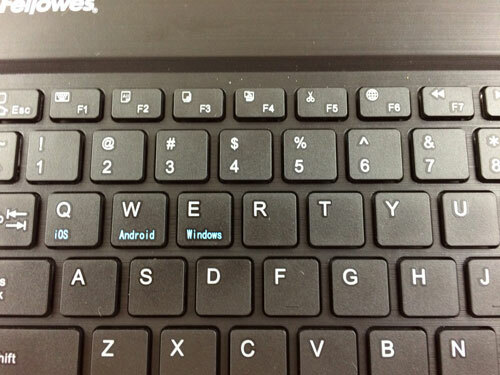 The letters Q-W-E pressed in conjunction with the Fn key will change the keyboard special keys behaviors. If you press Fn with one of the special keys at the top, they act as F1-F12 keys. 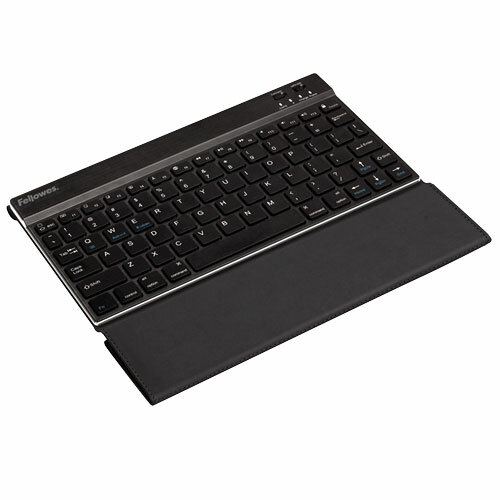 The keyboard cover when open will serve as a comfortable wrist stand with its soft material. It closes on itself using a similar magnet found on the folio case. I would have appreciated that the keyboard could pair automatically with multiple Bluetooth devices, say your phone and your tablet, when you need to. 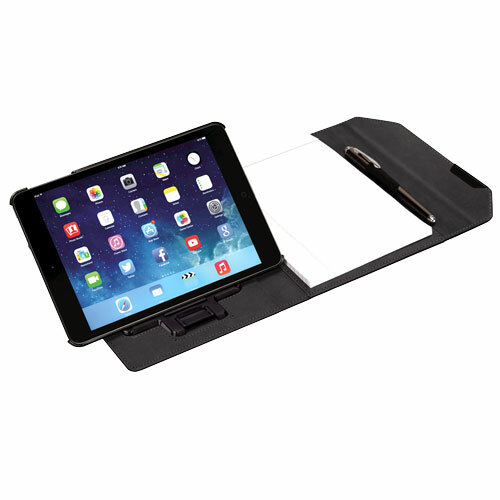 The folio iPad case is compatible with Apple’s Smart Cover. But while it offers three viewing angles, none of them is really suited to be used with the iPad’s onscreen keyboard. The keyboard comes with a charging mini-USB cable, and the connector is accessible on the side even if the keyboard case is closed. Which brings a secondary issue. As both the folio and the keyboard are not closed on the sides, water can infiltrate if you have to commute in a rainy environment. If you fill the folio with papers and the iPad, it can become very thick, but that is probably a no brainer if you need all of it. The last thing I would have appreciated is if we could remove the stand from the iPad case when we do not need it. Overall, I am very satisfied with the quality of the products and I’m sure business people will find them very interesting. The keyboard is probably the best of the two items if you already have a case for your mini that you’re fine with. But the folio stand is great for viewing video or reading text while having your iPad on a table.